Trixie here and it's my DT day over on the SVG Cutting Files Blog. 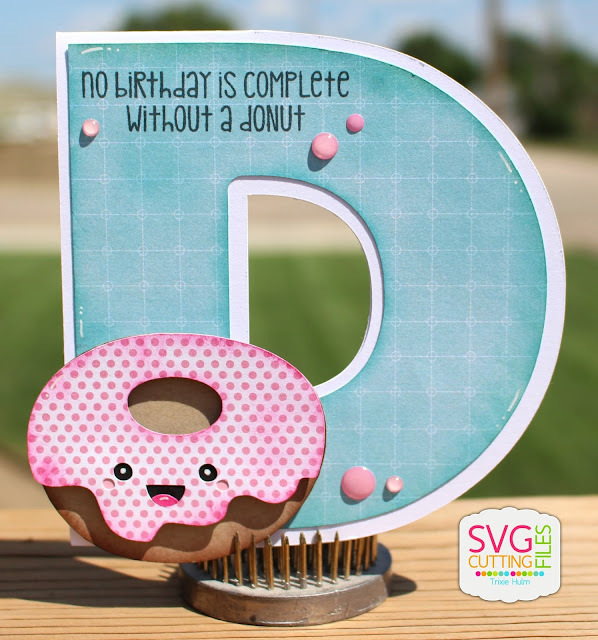 I used the new file Shaped Card Letter D from SVG Cutting Files today. I also used the Kawaii Donut...such a cute file. From Jaded Blossom I used the stamp set Love Donuts. Make sure you come back tomorrow for more sneak peaks. Hello! Mel from Doxie Mel Designs with a sneak peek for you today. There will be a new set of cards at the store this Friday, Alphabet Card Letters Set. I picked the letter "S" to make a card for something sweet. I picked an orange plaid for the card base and cut a mat in white so you could write inside the card. Hey Everyone!! Candace here from Candi O. 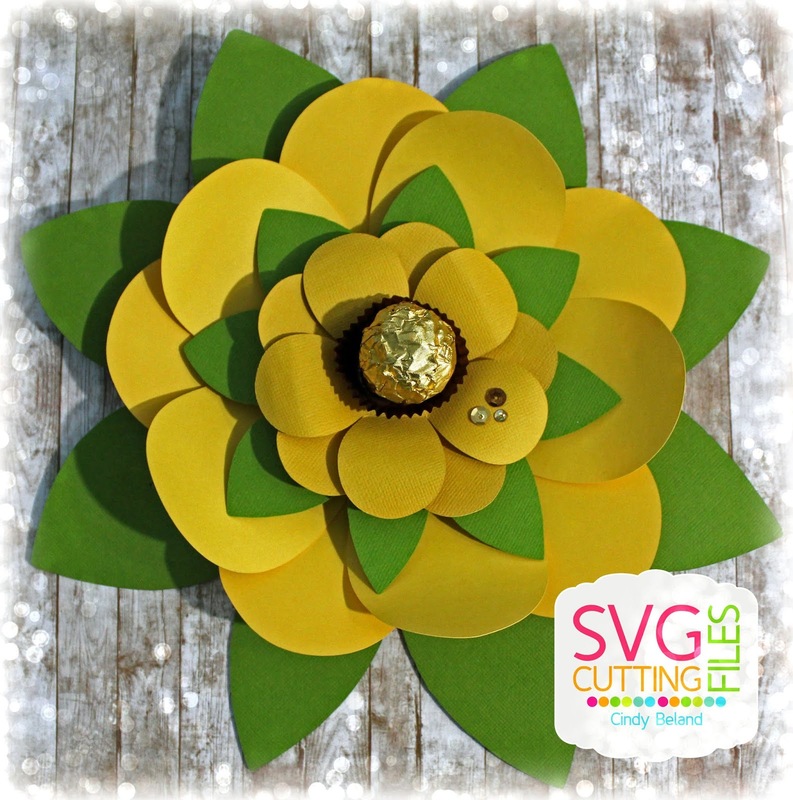 Designs and it's my day over at the SVG Cutting Files Blog and I'm showcasing a new file that will be available on Friday ~ Cactus Cupcakes. I used the larger of the 3 cactus and added it to Card Sketch 93 - these cuts make card making a snap!! of it.... Super simple to make and so pretty!!! Hi everyone! 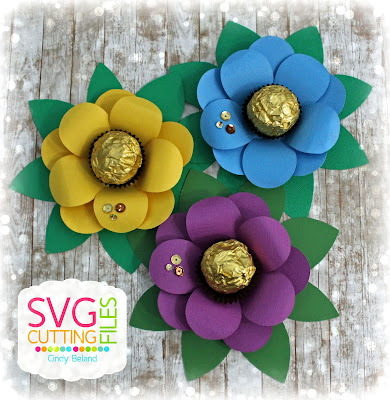 This is GiGi from The Cricut Bug and I have a treat box to share. I used the NEW Fish Cupcake that will be available in the store today along with the Angled Side High Box. I started this project with the Angled Side High Box and I cut out with my Cameo. I also cut the NEW Fish Cupcake and added it on pop dots to the front of the box. I used a white gel pen to add some highlights and a Versa Mark Pen to add the cupcake liner lines. I filled a bag with bubbles and candy and tied it close with some twine. To finish, I added the tag cut with the Jaded Blossom Card Layer Dies 1 and stamped the sentiment from the Fish On stamp set. Its my day over at SVG Cutting Files ! So I used this cut file to create 12 thank you cards to send to friends who had given me a birthday present !! 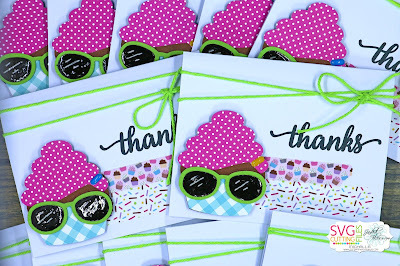 I used washi tape the Jaded Blossom stamp from Supersized Thank You set, and used glossy accents on the sunglasses to make them shiny !! Thank you sooo much for stopping by today !!! Hey Everyone!! Candace here from Candi O. 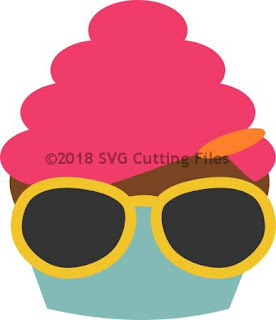 Designs and it's my day over at the SVG Cutting Files Blog and I'm showcasing a new file that will be available on Friday ~ Watermelon Cupcake. 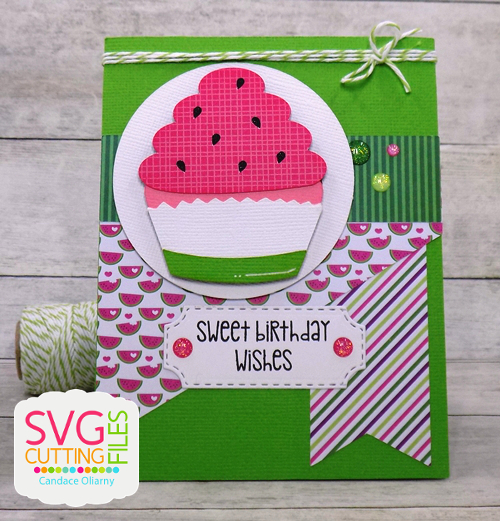 I thought this cupcake would make a sweet birthday card when combining onto Card Sketch 69. 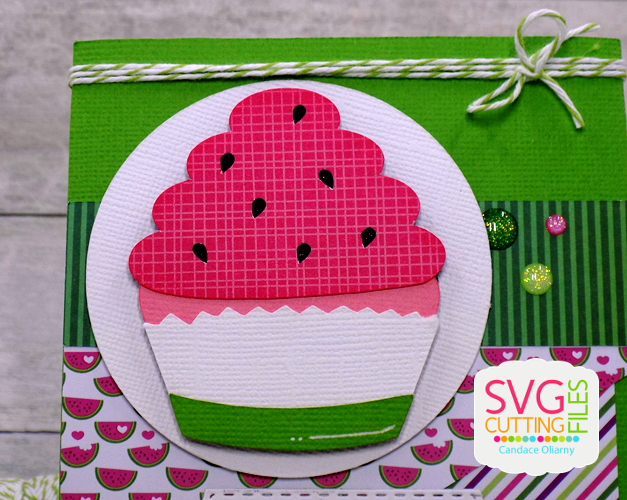 You could make a shaped card from this watermelon cupcake too!! 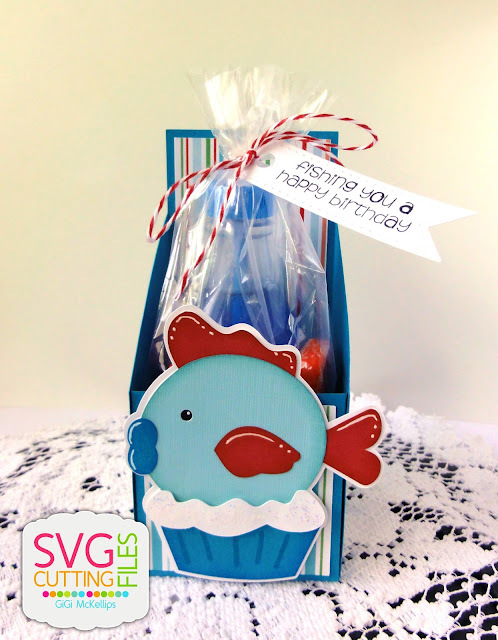 Jamie here to share the new Sharks Cupcake file! 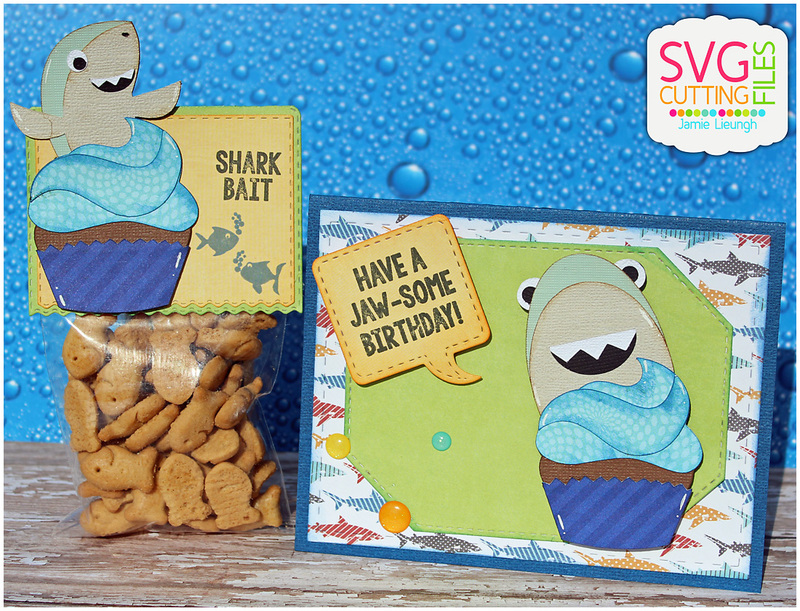 The new Sharks Cupcake File comes with 2 different sharks! 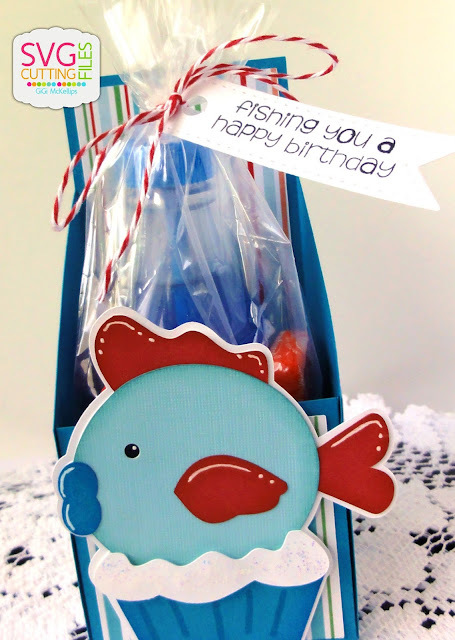 I created a treat with the Ric Rac Topper and a 3x4 bag filled Goldfish. 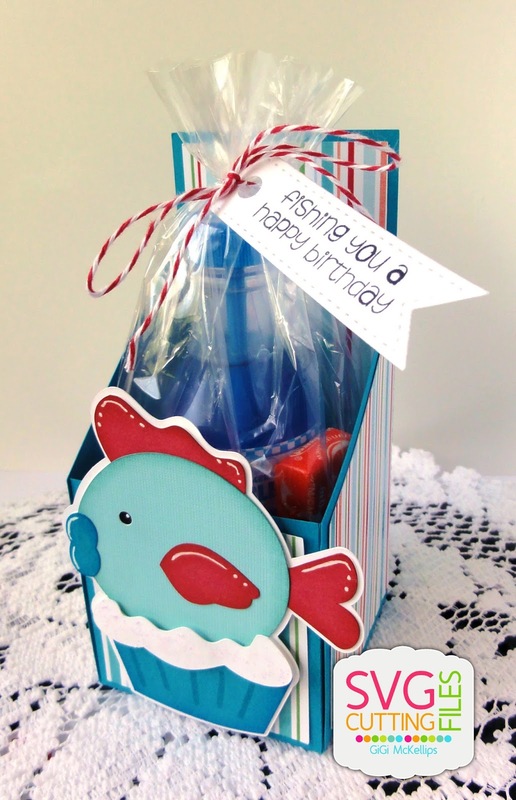 Then I pop dotted the other shark cupcake to an Octagon Die on top of a Card Mat Die. I used sentiments from Under the Sea and stamped one a Word Bubble Die. Aren't these Shark Cupcakes awesome?! 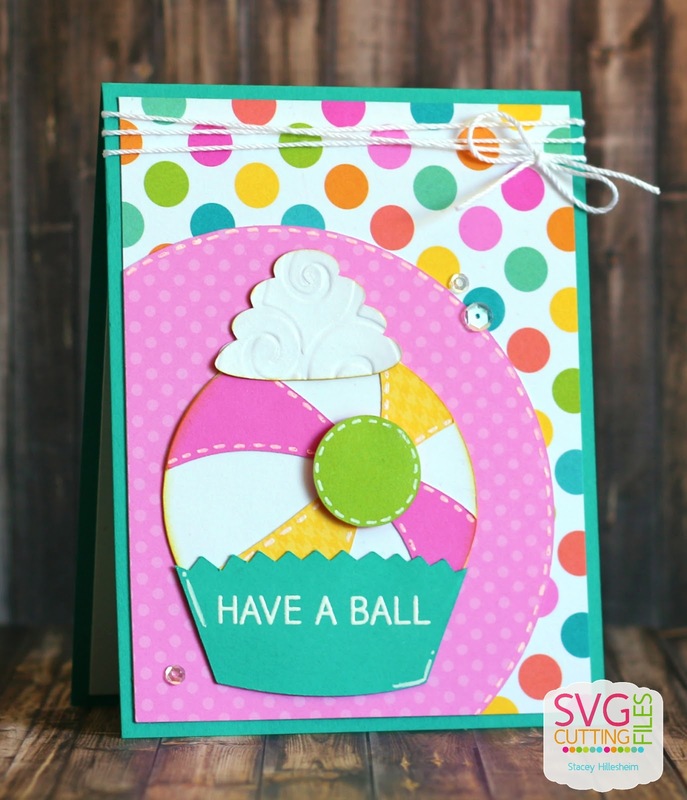 Stacey from Stacey's Creative Corner here with you today and I am giving you a little peek of a file that will be in the store this Friday called, Beachball Cupcake. I created an A2 card from some Bermuda Bay cardstock and layered it with some fun patterned papers from Doodlebug. 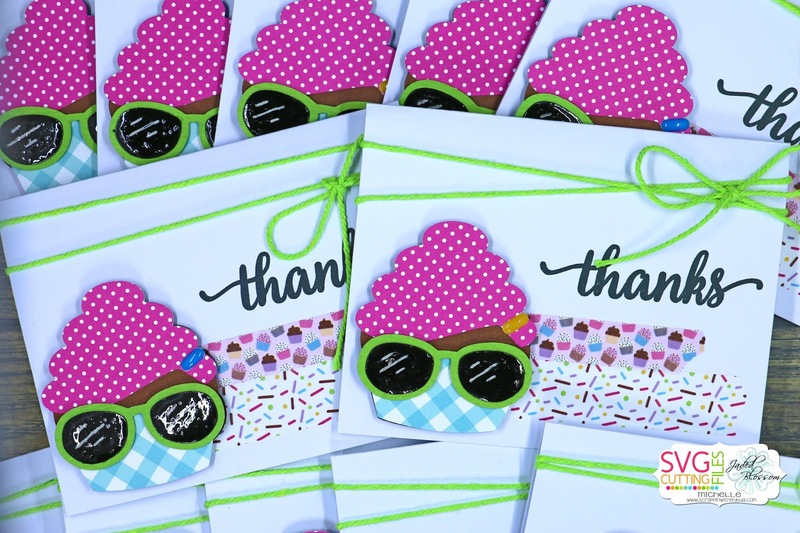 I cut out my Beachball Cupcake and heat embossed my greeting. I finished my card with some clear sequins and some crochet thread. Hey Everyone!! Candace here from Candi O. 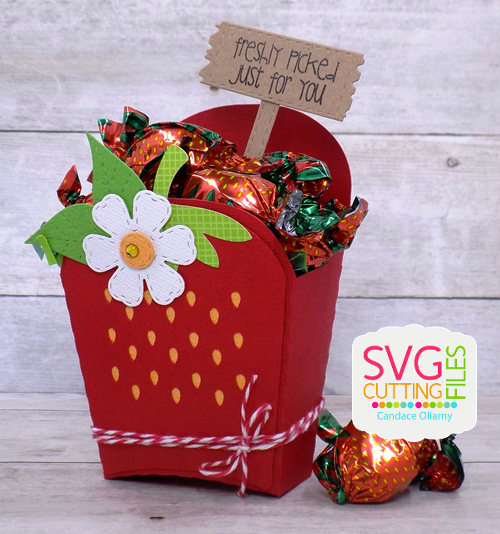 Designs and it's my day over at the SVG Cutting Files Blog and I'm showcasing a new file that will be available on Friday ~ Strawberry Fry Box. How fun is this box?!? 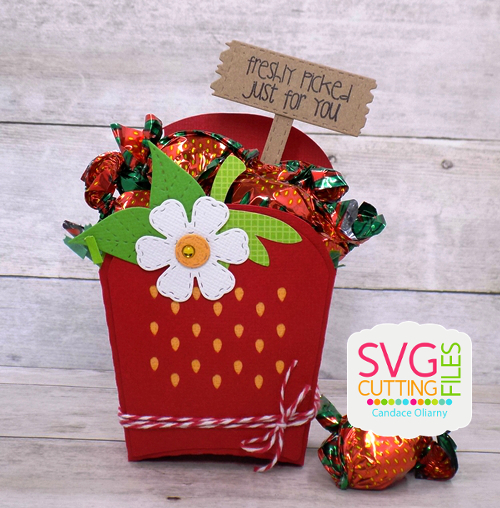 I added some dies, twine and sentiment to the box and some yummy strawberry candies! Friday in the store. SUPER SWEET treat box!!! 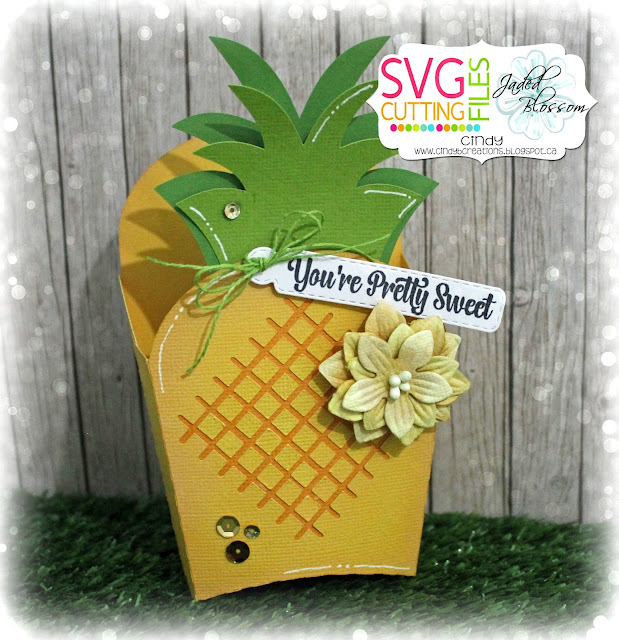 I used Mini Tag Dies for the tag and the Be a Pineapple for the fun sentiment.